After a full month, The Dark Knight is finally set to be toppled from the top of the box office, even as it moves into the number two spot overall. This week, another Wednesday comedy challenges Batman, but another week and more starpower make it more assured. Movies about Hollywood are often a really tough sell. Get too inside baseball, and nobody cares, stay far enough away and what's the point? So it's a fine line that movies like Tropic Thunder have to walk, although an easy way to walk it is just to be really damn funny. 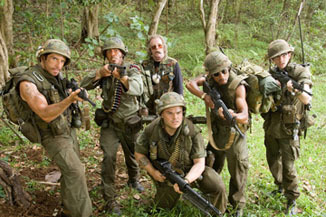 Ben Stiller directs Tropic Thunder, which is based around a troubled Vietnam war movie production starring a bunch of spoiled Hollywood bigshots. Stiller himself is front and center as Tugg Speedman, a Tom Cruise-like figure who desperately and transparently wants acceptance beyond just being a superstar. Jack Black is a shock-comedian trying to stretch his legs in drama, while Robert Downey Jr. is a troubled Australian actor in search of acting glory, who undergoes surgery to make him "black" in order to play the movie platoon's sergeant. It's somewhat telling that this blackface performance, albeit one under a protective level of irony, is turning out to be one of the least controversial elements of the film.